Are Amp Landing Pages All They're Cracked up to Be? For a while now you may have heard the buzz surrounding Google’s Accelerated Mobile Pages (AMP), and—if you haven’t already done some research—you might be wondering what all the fuss is about (or wondering why a landing page and conversion platform like us hasn’t mentioned this trendy topic yet). Well, we’ll get to all of that! Today we’ll walk you through everything you need to know about AMP as a marketer and why your Google rep has likely been singing its praises. First up: What is AMP? AMP is a project that was first announced by Google back in 2015 as a means to serve up mobile pages faster. Accelerated mobile pages use a restrictive HTML format to serve up web pages almost instantly to your visitors, with the added benefit of pages being cached and pre-rendered by third parties (like Google, Facebook, Twitter, Bing News, and Cloudflare). This is a stark change from waiting for every single element on your page to load and, at its core, it’s a way of developing simple web pages that meet strict guidelines for preventing slow load times. It’s helping bring the internet back to basics. How AMP pages look in mobile search results. Early adopters of AMP included publishers like The New York Times, The Guardian, and The Wall Street Journal. Much like Facebook’s Instant Articles, AMP gave these publishers a way to reach audiences in an almost-instant way (ultimately important for decreasing bounce rate, and signalling to Google your content is satisfying visitors). Since publishers run their business on page views, this was a natural place to start and great fit for AMP. 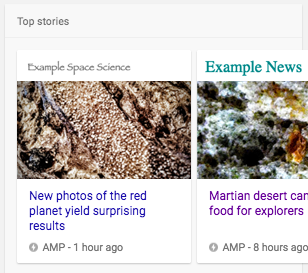 Google then created extra incentive for publishers by prioritizing AMP articles in their “top stories” carousel. 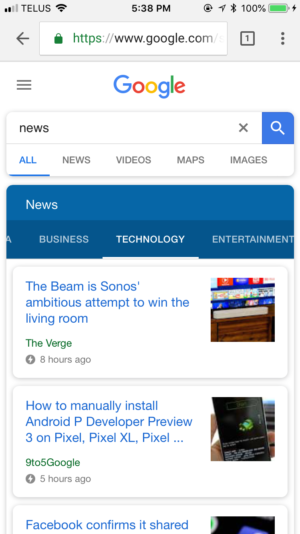 You can currently spot AMP articles in your own mobile search results by looking for the AMP thunderbolt symbol. Image via Google developers guide. AMP landing pages are a perfect match for publishers, but serving up news faster is not its only use case. Believe it or not, even eCommerce brands are increasing their revenue with the same traffic by converting their product pages to AMP. While this giant conversion over to AMP may sound like a massive undertaking, remember: You don’t need to create an entire AMP mobile website like Aliexpress. You can start with a single landing page that lots of customers reach from organic or paid search. 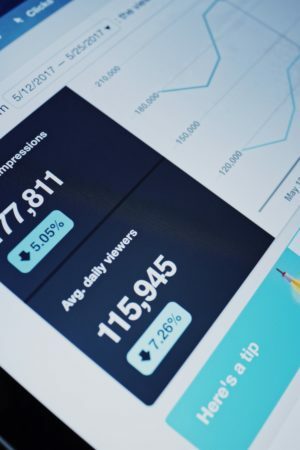 Simply decreasing your bounce rate on the visitor’s first entry and speeding load time up can have a big impact on first impressions, and ultimately your conversion rate. We can’t deny that Google has been the driving force behind the AMP technology and its adoption around the world. But despite its massive role in driving AMP forward, the team is insistent that AMP is not a Google project, but rather an open-source project. Although the lion’s share of the more than 500 contributors on GitHub are Googlers, they’re not the only ones. It’s true mobile is a huge part of Accelerated Mobile Pages (it’s in the name, after all), but that can be a little bit misleading. As Paul Bakaus from Google explains, AMP HTML is mobile first but not mobile only. He believes you’ll see better gains from AMP on mobile pages, but recommends trying AMP on desktop as well. What are AMP landing pages good for? We know that fast-loading pages equal lower bounce rates and higher conversions, and AMP provides an almost foolproof way of achieving fast mobile landing pages. Its strict guidelines for what can be included have speed best practices built in, which is why AMP landing pages have a medium load time in under one second. And let’s be honest: We could all use some extra conversions on our landing pages via speed increases. So what does AMP mean for SEO? While an AMP landing page does not necessarily equal a higher search ranking, Google recently announced that, starting this summer, page speed will finally become a ranking factor in its mobile search algorithm. While Google has always favored content with a positive user experience (speed being a part of that) speed did not previously have a direct effect on the ranking algorithm. Before July 2018, it might be a good idea to do some spring cleaning of your mobile landing pages (swapping out massive images and keeping things small)—whether these pages are accelerated or not. What do AMP landing pages mean for PPC? AdWords expert and ex-Googler Frederick Vallaeys has even called AMP landing pages “the best kept AdWords secret” due to the opportunity for improving conversion rates. At the end of the day, the reason you’d create an AMP landing page is to improve your page speed. By creating these pages, you ensure fast load time, but this doesn’t guarantee your content is good enough to keep people around. Page speed is only one factor in a positive landing page experience, and won’t solve the problem of bad content. Moreover, if page speed is what you’re after, AMP is only one way of achieving it. Even the AMP Project’s website admits that the format puts user experience above the developer experience. Simply put, it’s not the easy way to do things. So before jumping straight into AMP, consider whether or not you can reduce page speed in simpler ways, like cutting back on scripts and image sizes. Not sure where to start, try running your landing page through our free Landing Page Analyzer for some actionable tips. Photo by Henri L. on Unsplash. Photo by Igor Ovsyannykov on Unsplash. One of the best features of AMP is also one of its biggest drawbacks. Since the AMP pages are pre-cached, they are served from a different domain than your own. That means that your website visitor might click an ad, then visit your AMP landing page served up pre-loaded from Google.com, and then click through to your website. This can really throw off your site’s analytics, splitting up your user sessions between your domain and third-party domains. If you’re not comfortable giving up perfect analytics for gains in load time, AMP might not be for you. Worried about your website visitors seeing inconsistent domains? As of last month, AMP released an update that will keep the display URL as your own domain even if the page is being served from another domain such as Google.com. Just because AMPs format is restrictive doesn’t mean it’s a walk in the park to implement. Developing AMP pages could take your developers significantly longer to create than a non-AMP page. They’ll then need to validate that their code ticks all of the boxes of the AMP format and also upkeep the pages to make sure they continue to comply with these restrictions. A smaller restriction (but one nonetheless) is that AMP only supports the most recent two versions of major web browsers. This means if your visitors are hanging onto a circa 2014 version of Chrome, they won’t see your AMP page. Like anything, there are two sides to the AMP story. Because of its close ties to Google, some think the company has too much control, using its power to shift the internet to a new way of developing web pages altogether. Some think it’s unfair for Google to pressure companies to adopt the framework in order to reach the top stories carousel or maintain their organic rankings. Others worry that Google could abandon AMP at any moment, after more than 1.5 billion web pages have already been published using the format. On the other side of the argument, web users are speaking for themselves by abandoning slow pages at a faster rate. They’re also choosing Google more than any other search engine. Although there are alternatives, Google holds 90% of mobile market share. There must be a reason for this, and I’d hazard a guess that it’s because Google gives a better user experience than its alternatives. This info’s all well and good, but you’re probably wondering: what’s Unbounce—best known as a conversion and landing page platform—going to do about AMP? We’re happy to share that we’re currently building AMP capabilities into the Unbounce builder. We’re premiering this functionality with a tight-knit group of customers in an alpha test before we open up to a wider closed beta of additional customers. The reason we’re working with a small group first is to ensure that we are able to get early feedback while we work on adding more capabilities. We’ll be closely monitoring conversion data from the alpha participants to ensure customers are seeing the value that we think they’ll see with AMP. By now you’re likely convinced that fast pages are critical to your conversion rates, and AMP can help, so you may be wondering, what took Unbounce so long to build (let alone talk about) it? 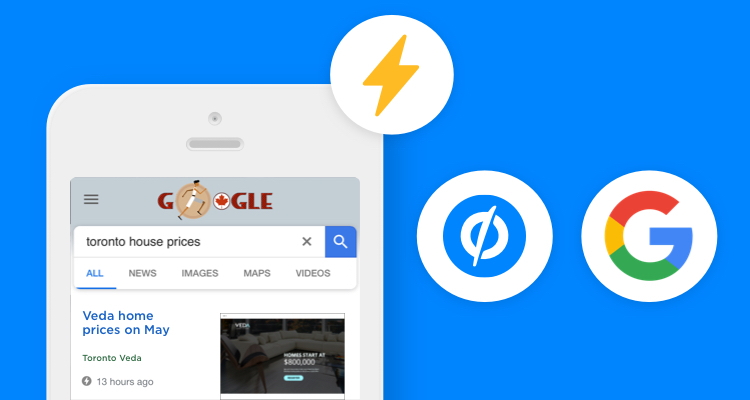 Well, we began investigating AMP and how it would work in the Unbounce builder back in 2017, and our friends at Google have been supporting us along the way. We made the decision not to publicly share our progress on AMP until we officially kicked off the development of our alpha program last month. Trust us, page speed is something that’s been on our mind for quite some time. Last summer, our team became one of the first to complete Google’s Mobile Site Certification, and in September we returned to Google’s Canadian HQ in Toronto to join the search giant in co-hosting a mobile speed hackathon. Most recently, Google mentioned our alpha at their annual developer conference. We had hoped to bring you AMP a little bit earlier, but our team has been heads down for the past several months focused on the new General Data Protection Regulation (GDPR). Keeping your data safe and secure is our top priority, and we believe it is important to provide you a landing page solution that is GDPR compliant as this sets a critical foundation. We are proud to say after months of hard work, Unbounce is GDPR compliant. Less than a month ago, AMP also released an update designed to help AMP pages become GDPR compliant as well. Not sure what we’re talking about? Learn all about GDPR and how it affects your business here. (It’s a big deal). Now that we’ve got your data safe and secure via GDPR compliance, our team is full steam ahead experimenting and developing AMP capabilities in the Unbounce builder. We’ve made some great progress and it’s looking pretty darn cool if I do say so myself (seriously, we can’t wait to show you). Once we’ve completed our alpha test, we’ll be widening the scope to a closed beta test. Updated! This part’s a bit of a throwback. We launched AMP in full in February 2019. 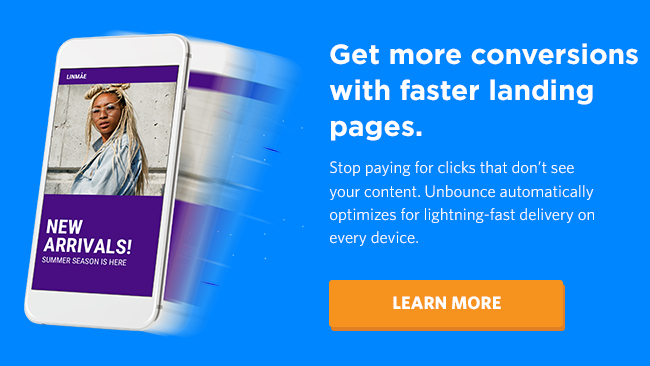 That means you can build AMP landing pages today with Unbounce. Explore how the builder makes creating AMP-ready pages quick and easy. We’ll be sharing our progress right here on the Unbounce blog, and—if you’re a current customer (or about to create landing pages with us)—we invite you to sign up for early access to the beta once it’s launched. Larissa is the Paid Media Manager at Unbounce. She got her start in PPC agency-side, where she managed a portfolio of high-growth tech brands. You can usually find her obsessing over CPAs or Instagramming the office dogs. Follow her on Twitter at @chezlars.